One of the most important aspects of the ukulele is having the right strings. Good strings can make all the difference in sound, even making a cheap ukulele sound bright and awesome. Unless a ukulele comes with a quality string already on it, it is always wise to change the strings on a new instrument. Just remember as a beginner to follow certain guidelines on string makeup and tuning. It can be very easy to damage a ukulele with the wrong strings or by attempting to tune a string higher than it will go. With a length of 16 inches and scale of 11 inches these tiny ukuleles are often tuned DGBE. Similar to Baritone tuning just two octaves higher. The most well known ukulele size with a length of 21 inches and a scale of 13 inches. Most often tuned GCEA, but also sometimes ADF#B which is known as D-tuning and was the most popular tuning in the 1930’s and 1940’s. These days most popular ukuleles sold come in concert size. With a length of 23 inches and scale of 15, they make it a little bit easier to fret for the beginner. Often tuned GCEA, ADF#B, or even low gCEA. With a length of 26 inches and scale of 17 inches, the tenor still has that common ukulele sound and is larger for those with big fingers. Tenors can be tuned GCEA, ADF#B, and also low gCEA. With a length of 29 inches and a scale of 19 inches the Baritone ukulele starts to get closer to an instrument known as the tenor guitar. Baritones are tuned DGBE and have more of a guitar sound than a ukulele vibe. However, if you buy special strings it is possible to tune it to GCEA. With a length of 30 inches and a scale of 20 inches, the bass ukulele is hardly anything like a regular uke. It is tuned similar to a bass guitar with special strings to EADG. With a length of 32 inches and a scale length of 21, this ukulele dives even deeper into low tone territory. It is also tuned EADG like the bass however at an octave lower. These are the most popular strings and the most commonly used. The way the nylon is used varies by each company so one nylon string may not sound as great as nylon from someone else. Nylon stretches a lot so when you first put them on it will take numerous re-tunings before they hold a note. For a very long time animal intestines were used for the strings of acoustic instruments. Various livestock are used but most commonly it is from sheep or goats. Some people are purists and like to use real gut on their ukulele, however they are very expensive. Honestly when you compare real gut to modern nylon and other man made strings, some of the artificial strings sound a little better. Strings made from steel are only used on hybrid instruments like guiteleles, if used on a regular ukulele the tension will likely snap the instrument right in half! Steel strings are what most guitarists use and are often not necessary in the ukulele world. These strings are made out of the same material as fishing line. They often have a brighter sound than nylon and are less effected by changes in temperature, they will also hold their tune longer. These strings offer a little more brightness and durability than nylon strings. Titanium strings have been increasing in popularity in the past few years. These are nylon strings with a polymer wrapped around them, often used for low G strings or baritone strings. They help with the bass notes being more pronounced. However, wound strings can produce more finger squeaks. These are nylon strings that have metal, mostly copper, wound around them. They also are used for bass notes and can also produce a lot of finger noise. The strings you buy will all depend on what size of instrument you have and what you may be trying to accomplish. For example, a baritone ukulele is often tuned DGBE, if you wanted to tune it like a soprano you would have to buy special strings. Trying to tune DGBE strings up that high will result in broken strings and maybe a broken ukulele, so instead you must buy special GCEA baritone strings. Another common tuning is low G on the soprano or concert, to achieve this you must buy a special wound G string to achieve the lower pitch. Thanks to the growing popularity of ukuleles there are a variety of alternate tunings and string makeups out there to buy. Generally, when you start out it is best to buy something like nylon and with regular tuning. Learn the basics of how to tune your ukulele, get used to playing, and then after a few months maybe try experimenting with a new tuning. The easiest tuning to experiment with is ADF#B, this is simply done by tuning GCEA a whole step up. One step won’t create that much tension but be weary of tuning up any further than that. (Some players prefer this D-tuning as more Hawaiian sounding). In some cases, strings can be used interchangeably, like soprano and concert ukuleles can share each others strings. Once you get into the bigger tenor and baritone sizes the strings are not interchangeable. And of course with ukuleles like the bass and sub bass they require special strings that are nothing like the rest. While strings are a matter of personal choice there are certain brands that stand out amongst others. I would recommend starting out with the more popular ones and once you get better at playing the ukulele then start branching out into new tunings and brands. 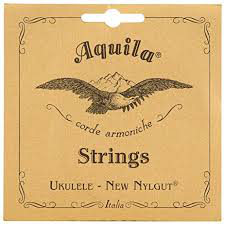 These are hands down the best strings out there, in fact most ukuleles come with Aquila strings when you order them. They use a synthetic material known as Nylgut that is supposed to mimic the sound of real gut, in some cases maybe even sounding better. Aquila sells ukulele sets for almost every size of uke there is, including special wound strings for low g’s and baritones. They also offer a new Red Series of string that is supposed to allow for better intonation. I tried the red series and I wasn’t a big fan but many people seem to like them. Either way, you really can’t go wrong when buying strings from Aquila! I also happen to be a mandolin player and I love my D’Addario mandolin strings. Over the past few years they have been trying to increase their popularity with ukulele players. 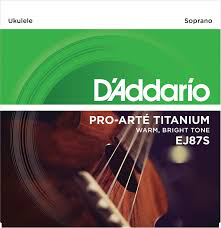 The most well known D’Addario’s are the titanium strings. If you are looking for a brighter tone beyond nylon or Nylgut, these are perfect for you. Martin of course has a long history as an instrument and string maker. I’ve always felt that they make a much better guitar string, but some folks love the sound of their ukulele strings. They are made of fluorocarbons so they have a very clear and warm sound and hold their tuning longer than nylon. While not as popular as the other brands some players love the punchy sound of GHS. 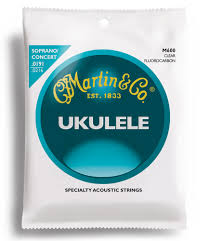 They are definitely an improvement of basic stock strings that most companies include on new ukuleles. If you have tried GHS before and like them, there is nothing wrong with that. However, if you are new to ukulele I would likely stick with Aquila. Ukulele strings are really not terribly expensive so why not try a new brand every now and again, you may stumble onto the perfect string for your instrument! As far as which string to buy, well that is up to you. If you decide to purchase any of the brands or styles in this article you will likely not be disappointed. Just be sure to follow the guidelines from the companies, also make sure you know which octave you are tuning for. The average concert or soprano ukulele is tuned specifically to G4-C4-E4-A4, the number 4 beside the letter stands for the fourth octave on the piano. If you had no tuner you would use that middle octave on a piano to tune your ukulele. So let’s say you want to tune your concert with a special low G string, in that case the tuning is G3-C4-E4-A4. You now want to tune that top G string one octave lower. Another example of this is the baritone ukulele is tuned at D3-G3-B3-E4, which is why we need to have special baritone strings because regular concert tuning can’t detune that far down. As a beginning ukulele player it helps to have a tuner (or a piano!) that shows you what octave you are at, that way it makes tuning a hundred times easier. If you have decided to buy a 6 string or 8 string ukulele you will of course have to buy special strings. These ukuleles have double course strings that require one finger to hold down two strings. The 6 string tuning is GcCEAA, which means the two C strings are an octave apart and the two A’s are in unison. 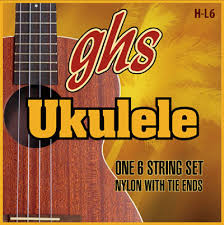 The 8 string ukulele is tuned gGCcEEAA, which means the G’s and C’s are two octaves apart while the E and A are in unison. Notice we often use a lower and upper case letter to denote different octaves. A regular 4 string ukulele is once again GCEA, so the low g tuning would be gCEA. Once you get used to what octave level each ukulele size is tuned at, and what string makeups give the best sound you will reach a point where you can start experimenting with your own sound. And eventually with lots of practice you may be able to tune all octaves with just your ear, it is a great goal to reach for! Is it possible to get a contrabass uke tuned GCEA? So technically it is possible, but your strings must hold the extra tension. You also have an alternate option: tune your UBass to FBbDG and put a capo on 2nd fret. I would say that’s the easiest and safest way if you want to try, because you only need to tune E and A strings +1 step up.